Look, up on the stage!! It's a dancer... a singer! It's a bubble... a dinosaur! Seattle-based performer Christian Swenson has toured the world enchanting young and old alike. Morphing into characters, dinosaurs, aliens and "body music" on the spot, he is a living, breathing, moving, singing, dancing, transforming machine. The result is fascinating, inspirational and highly entertaining. 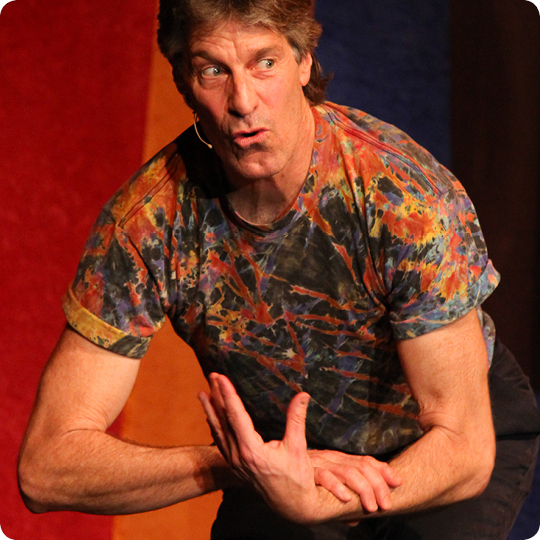 Audience members are invited to join him to "Act Like Water", create stories, music and enact "word improvisations". Admission is free. No registration necessary, but do come early as this is a popular program. Each 45-minute workshop takes place twice, at 11am and 1pm. This workshop is recommended for ages 3-12, but all are welcome! Learn more about ArtStarts on Saturdays and ArtStarts at River Market, and the line-up of upcoming workshops.